We have proposed an abstraction technique that uses the formulas of variants of the modal μ-calculus as a method for analyzing pointer manipulating programs. 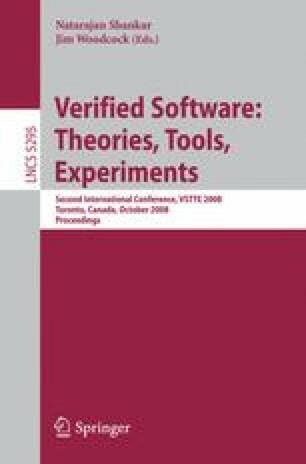 In this paper, the method is applied to verify the correctness of the Deutsch-Schorr-Waite marking algorithm, which is regarded as a benchmark of such analysis. Both the partial correctness and the termination are discussed. For the former, we built a system on top of the proof assistant Agda, with which the user constructs Hoare-style proofs. The system is an optimum combination of automatic and interactive approaches. While a decision procedure for a variant of modal μ-calculus, which is available through the Agda plug-in interface, enables the user to construct concise proofs, the run time is much shorter than for automatic approaches.